This luxurious lotion is specially formulated to provide intense moisture for dry, sensitive skin everyday. Contains Epidermal Replenishing Complex (ERC), a unique combination of 5 key ingredients that protects dry skin and enhances hydration. Ingredients: Water, Glycerin, Hydrogenated Polyisobutene, Cetearyl Alcohol, Ceteareth-20, Macadamia Intergrifolia Seed Oil (Macadamia Nut Oil), Butyrospermum Parkii (Shea Butter), Acrylates/C10-30 Alkyl Acrylate Crosspolymer, Sodium Polyacrylate, Phenoxyethanol, Tocopheryl Acetate, Ceteareth-20, Stearoxytrimethylsilane, Stearyl Alcohol, Benzyl Alcohol, Farnesol, Sodium Pca, Panthenol, Cyclopentasiloxane, Dimethiconol, Citric Acid, Sodium Hyrdroxide. Instructions: Use daily for optimal hydration. Apply liberally as often as needed. 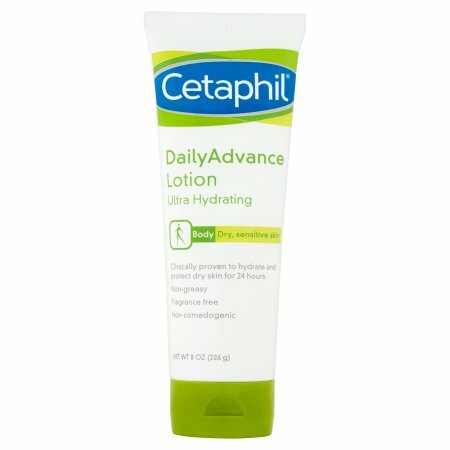 CETAPHIL DAILY ADV HYDRATING LOTION 8OZ by GALDERMA LABS,INC.